Our drink reminder has a simple intention. A Healthy Nutrition Starts When Drinking. Drink!Water is a simple funny health app for iPhone and Android devices that supports you on increasing your well being. 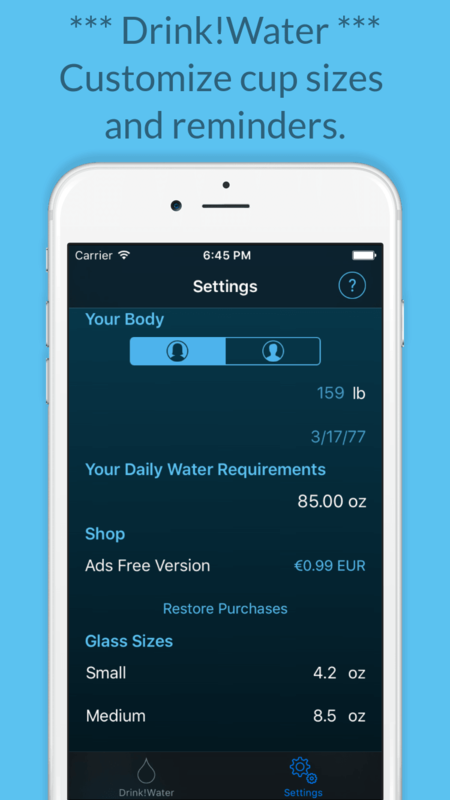 The app calculates your recommended daily water intake, reminds you on drinking and keeps you informed about your personal progress. All this with a healthy dose of fun. Drinking Water is essential for a healthy life. It supports you on increasing your wellbeing and on losing weight which will lead to an improved fitness implicitly. But it is a bad habit to drink too less water which will dry you out. Our everyday life teached us to ignore the feeling of thirst. Imagine that your body looses more than 2 litres of liquid a day. You may suffer from head ache, tiredness and lack of concentration. Later on you can damage your kidneys and face some other serious health problems. Therefore begin to drink more water today and boost your metabolism. Our tip: If you drink water instead of sweetened lemonades, you will have the further benefit, that you can easily lose weight and become more slim. Did you know that drinking a glass of water can reduce ravenous appetite? If you are on a diet, drinking water will support you to keep your balance. It has no calories and will have a great influence on your diet. This is what Drink!Water has been made for. Its a coaching app that helps you to keep track of your daily water consumption and improve your wellbeing. Several functions like calculating your required daily intake of water or a drink reminder are included as well. 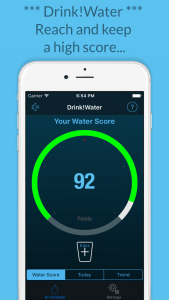 Drink!Water calculates your individual recommended intake of water. Drink!Water tracks the amount of drunken water. Drink!Water reminds you on drinking a glass of water frequently. Drink!Water is for free, like water should be. If you enjoy our app or have any suggestions, feel free to contact us! 2 Responses to "Drink ! Water – The Drink Reminder and Drink Tracker for your Well-Being"
Is a connection with Fitbit possible ? we currently support the Apple Watch, but with some of our planned features, a fitbit connection might be useful.